Send me your No. 1 Reason for Being Catholic. I will Leave a List of 95 Reasons at the Wittenburg Door in Germany next Sunday 9/10/17 at Mass!! CLOSED OUT AS OF 11:30 AM EASTERN since I now have to print the list before I leave in one hour. We have over 300 reasons to respond to Luther's 95. I will post a video next Sunday of me leaving the list at the Wittenburg Door. Thanks for ALL of your contributions. I will also post the list when I get back. ********************************************** Next Sunday our group will have Mass at the Catholic Church in Wittenburg Germany. 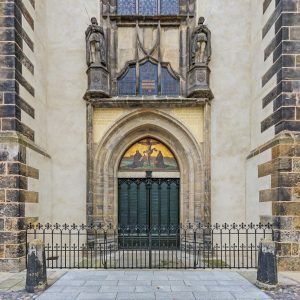 It was in Wittenburg that Martin Luther nailed his 95 Theses to the Wittenburg Church door. I will leave ANOTHER list — “95 Reasons to Be and Stay Catholic.” We need your help. Please send your best reason (or two or three ) for being Catholic and I will add your reasons to my list. I will leave it at the Wittenburg Door! Either add to the Comments below or email them to me at sray@me.com. You will see my leave them there on my daily YouTube video next Sunday. Join us daily on a virtual tour of the life of Martin Luther and a study of the Protestant Revolt. starting September 6. See the map of our journey, click here. For our brochure with our itinerary, click here. We have a bus full of excited Catholics with a good number of priests. We are following Martin Luther through his sites in Germany, arguing with him along the way. Ken Hensley is joining us to lecture and teach along the way. Fr. Steve Thomlison, a Catholic priest and convert from Lutheranism will be teaching as well and giving applicable homilies at all the Luther sites. I will put up a video of each day and the homilies and many of the talks. Join us virtually here at www.CatholicConvert.com.